Nedim Begović, Transport Planning Manager at the South East Europe Transport Observatory (SEETO) writes about the latest investments of the Core Regional Transport Network, underlining that although the last three years have seen a positive trend towards rail infrastructure investment, a lot more is still needed to increase the competitiveness of railways in the Western Balkans. SEETO and the Western Balkans region have been placing intense focus on the strategic planning and extension of the EU TEN-T Core Network to Western Balkans. As Western Balkans partners participating in SEETO are not EU Member States, they are not automatically included within the EU strategic networks and plans, so this is carried out gradually through accession and cooperation processes between the EC and Western Balkans partners. In 2015 new strategic objectives and guidelines for the development of the Western Balkans’ transport system were set, which was accomplished through several high level events to tighten cooperation in the region and also to streamline the priorities for overall regional development. The Western Balkans 6 (WB6) initiative conference between the Prime Ministers of the WB countries and the European Commission (initiated by the German chancellor held on 28 August 2014 in Berlin) provided a political framework for the more intensive development of transport infrastructure in the region. From a strategic point-of-view, substantial progress was achieved during 2015. Most notably, was the agreement by the six Western Balkan Prime Ministers in Brussels in April 2015 on the regional Core Transport Network and the composition of the list of regional infrastructure projects and soft measures to be implemented by 2020, as well as the extension of EU Core Corridor Coordinators (Vienna Summit in August 2015) mandate to Western Balkans. All of these measures aim to enhance connectivity between the Western Balkan partners and the EU network. The definition of the TEN-T Core Network for the Western Balkans represents a milestone in regional transport cooperation. For the first time the regional transport network will be integrated with the Trans-European Transport Core Network and the Western Balkans states will participate equally to the corridors management mechanisms, thus becoming part of the big European family in the transport field. This significant achievement also brings a great deal of responsibility and work must be carried out in the following period in order to implement the pre-identified infrastructure projects and complete the Core Network by 2030. Moreover, Western Balkans partners adopted and committed to a set of soft policy measures for which fast progress can bring higher added value to the infrastructure investments. On a medium-term (until 2020) their implementation should result in opening the transport markets, establishment of a competitive, reliable and safe transport system, and to increase the effectiveness of border crossing procedures. However, strategic planning is not enough for development of transport and railways in the region – especially taking into account the current poor condition of railways in the region – and this was fully understood by all the parties. For this reason, the European Commission allocated €1 billion in grants (with a co-financing rate of 50% for railway projects) for the programming period 2014-2020, where priority is given to transport and energy infrastructure projects. What lies before us are concrete rehabilitation and modernisation projects for railway improvement. As for the previous period, a significant amount has been invested in development of the TEN-T Comprehensive and Core Network to the Western Balkans, thereby setting the foundations for regional integration and economic development. Total investments (disbursed and committed) on the TEN-T Comprehensive and Core Network to the Western Balkans amounted to €12 billion in the 2004-2014 period and what is most encouraging is the constant increase in committed investments, despite the strong impact of the global economic crisis. €5.75 billion (48% of total investments) was already disbursed while the remaining 52% (€6.27 billion) is considered as committed investments. High investments in road infrastructure in the Western Balkans has been continuous since 2004, while there has been small investment in rail infrastructure projects – but that is changing slowly, mostly due to the projects on Corridor X and Route 4 in Serbia, financed through bilateral agreements (Russian loan) and IFI loans. From 2004, a total amount of €9.84 billion was disbursed and committed to road infrastructure, which makes up 81.4% of the total investments in the TEN-T Comprehensive Network to the Western Balkans. However, in the last three years a positive trend of investing in rail infrastructure has been seen with €1.13 billion committed from 2013. 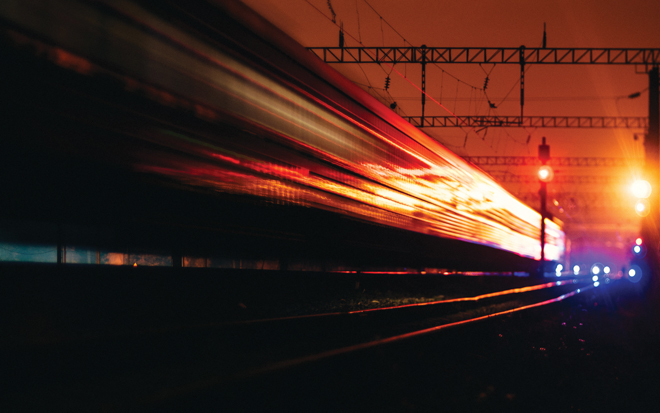 With €1.62 billion in disbursed and committed investments in the TEN-T Comprehensive Rail Network, railways are encompassing only a 13.5% share of total infrastructure investments in the Comprehensive Network. The recent global financial crisis and the present difficulties of the Eurozone have highlighted the interdependence of national economies both with and beyond the EU, which – together with the tightening of fiscal space – leads to difficulties in the financing of infrastructure development in the region. As for the sources of funding in Western Balkans, the highest share (39%) of overall infrastructure investments is financed through IFI loans. Primary sources of funding come from the budget and IFI loans, however, due to the reducing financing possibilities, SEETO Regional Participants increasingly turn to financiers outside the EU. Other sources, with a share of 27%, consist mostly of China’s Exim Bank, Russian Loans, Abu Dhabi funds, IDB, the Italian Government, the Kuwait Fund, OPEC, etc. and are showing a sharp rise within the last two years. The reason for this could be found in their favourable lending conditions. As for railways, the situation is comparable to overall investments in transport infrastructure (for all transport modes). The primary source of railway funding in the region comes from so-called ‘other sources’ (e.g. bilateral loans) encompassing a 51% share of committed and disbursed investments in the railway infrastructure. IFI loans are following with a 41% share. Unfortunately, other financing instruments, such as PPP projects and concessions, are not currently present for the railways in our region. Lack of investments and insufficient maintenance has influenced the transport flow and competitiveness of railways in the Western Balkans. Transport trends in the region differ between passenger transport and freight transport. Passenger transport is showing higher variations – for example, in 2014 regional passenger transport decreased by 21% in comparison to 2013. However, in 2013 it grew substantially compared to 2012. Freight transport in the region is in a better position with a 6% growth in 2014 and smaller variations in previous years (excluding the effects of the global economic crisis). Looking at the corridors individually, Corridor X (passing through Serbia and the former Yugoslav Republic of Macedonia) is one of the region’s most important railway routes – main line Corridor X (34%), branch Xb (12%), branch Xc (5%) of regional freight; main line Corridor X encompasses 45% of regional passenger traffic volume, branch Xb (14%), branch Xc (2%). Corridor X still needs to improve its level of infrastructure quality; however, large infrastructure projects that are needed to improve the corridor’s competitiveness are now underway. Corridor Vc, traversing Bosnia and Herzegovina, is second by frequency of freight traffic in the region (24% of regional freight traffic), after Corridor X. In terms of passenger transport, Corridor Vc is less intensive with only 5% of regional passenger transport. Route 4, connecting the port of Bar (Montenegro) to Belgrade (Serbia) and further in to Romania, is also, in regional terms, one of the most intensive lines with 14% of freight traffic and 20% passenger traffic. Despite freight transport slowly increasing in recent years, still both passenger and freight transport are far below the levels of the late-1980s. In order to address the regional challenges and identify Western Balkans regional priorities, several instruments are being used depending on the level of planning (regional, national, Comprehensive and Core). A national prioritisation process is being conducted through National Investment Committees with a newly established instrument for better coordination of priorities between all sectors (agriculture, social, transport, etc.). SEETO is identifying a list of regional priority projects on Comprehensive and Core Network based on their maturity (eligible for funding) and strategic relevance (priority projects for preparation) and publishing them in its Multi Annual Plans (MAPs). During 2015, in preparation for the Vienna Summit, a list of pre-identified projects on the Core Network was selected in order to further focus investments and infrastructure projects in Western Balkans. The estimated investment required for the implementation of MAP (48 priority projects) is approximately €9.64 billion: €2.67 billion eligible for funding and €6.97 billion for preparatory. Eleven of the 48 projects are railway projects and three of them are ripe for funding. As for the railway projects in the Core Network pre-identified list, eight projects have been identified with a total estimated cost of €1.6 billion which represents a 21% financial share of regional priorities for 2020. Road projects are still prevailing in the priority list, however from year-to-year an increase in the number of rail and nodes (seaport, airport) projects is evident, slowly shifting the focus to these modes in future transport development in the South East European region. Implementation of these projects is strongly needed in order to improve railway infrastructure. Transport policy was not neglected as part of the WB6 initiative. Transport policy includes a set of actions, measures and reforms that relate to the whole transport system and not necessarily to either the Comprehensive or the Core Network. However, the latest political developments concerning the definition of the Core Network for the region are expected to influence transport policy in terms of streamlining and speeding-up policy reform measures. The Western Balkans summit in August 2015 in Vienna confirmed the list of soft measures giving specific time-lines for each measure. Progress with regard to their implementation will be reviewed at the next Summit in France in 2016. Reduction of dispatching time at road BCPs due to the installation of single-window BCPs. Development of railway infrastructure lags behind road infrastructure, with insufficient funds and a low level of maintenance over previous years contributing to the current poor condition of railways in the region. However, the last three years have seen a positive trend of investing in rail infrastructure, but in order to increase the competitiveness of railways in the Western Balkans, further investment in railways infrastructure is still needed. Furthermore, implementation of soft measures and facilitation of border crossing procedures, together with the introduction of one-stop-shops and increasing railway operational performance, are equally important issues and should be carried out in parallel to infrastructure development. This should allow the regional railways to further integrate into the international transport networks and facilitate the transportation of goods from East to West. This will also allow passenger transport to become more efficient, faster and – in the long-run – make the South East Europe region more competitive and integrated into the world economy. Nedim Begović is a railway expert at the South East Europe Transport Observatory (SEETO) and is a graduate of the Faculty of Traffic and Communications from the University of Sarajevo, Bosnia and Herzegovina. Nedim has been employed in SEETO since 2010 where he is involved in monitoring the performance of the SEETO Comprehensive Network and the preparation of development plans, as well as facilitating the rail reform process in the Western Balkan region.